Peaman event at Kailua Pier in Kona. HONOLULU — The Board of Land and Natural Resources (BLNR) at its regularly scheduled meeting today reviewed a proposed administrative enforcement action against Kona resident Sean Pagett for organizing unpermitted fitness swimming events in Kailua Bay. The Board voted to dismiss the fine upon receiving assurances from Pagett’s counsel, former Hawaii mayor William Kenoi that Pagett will apply for a DOBOR permit, including obtaining required insurance coverage, for all future marine events he plans. The Board also voted to confirm that DOBOR rules do authorize the boating division, acting in cooperation with the U.S. Coast Guard, to require and issue permits for marine events, including swim races. The DLNR Division of Boating and Ocean Recreation (DOBOR) brought the proposed enforcement action which recommended the issuance of fines totaling $10,000 to Pagett for two violations of the permit requirement rule. “Permits help DOBOR, the U.S. Coast Guard and ocean safety agencies to keep track of people and boats in the water, prevent potential conflicts and hazards to life and indemnify the state if there should be an accident. Unless there are consequences for violating state statutes and administrative rules, people do not have an incentive to abide by our rules and directions which are necessary for public safety,” Underwood added. DOBOR officials said that Sean Pagett (also known as “Peaman”) formerly obtained permits but stopped when the insurance requirement changed. He has staged 350 events over the years that have included running, bicycling, swimming, or a combination of each in which there are 70-120 participants per event. 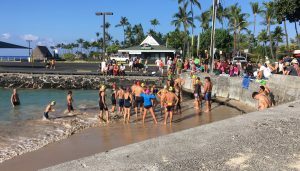 Events involving swimming have typically been staged from, or around the Kailua-Kona pier, and swim portions of events take place within the adjacent designated Ocean Recreation Management Area (ORMA). The swim zone is marked by lines and buoys, to keep swimmers out of restricted areas around the pier used by boats. In late 2016, DOBOR staff and DLNR Division of Conservation and Resource Enforcement (DOCARE) officers advised Pagett that a Nov. 27, 2016 swim-run race event was held without a marine event permit, using the swim zone at Kailua Pier, an administrative rule violation. The same morning a cruise ship moored offshore was ferrying 2000 passengers into the pier by tender, posing a potential safety hazard. On December 12, 2016, officials met with Pagett and his attorney to discuss his events and ways to comply with permitting requirements. Pagett claimed the rule did not apply to his events since no fee was charged, participants did not have to register, and no prizes were awarded. He claimed participants were “a group of friends who gather to do timed events.” He was warned that continuing to hold events without a permit would be a violation of state rules and subject to citation and fines. Then on December 25, 2016, Pagett held the “Peaman Birthday Bonanza” which involved a ½ mile swim and 3.9 mile run/walk race. He did not apply for a marine event permit from DOBOR, and no permit was issued to him. He was cited by DOCARE officers.